The newest character to hit the Heroes of the Storm PTR is D.Va from Overwatch. 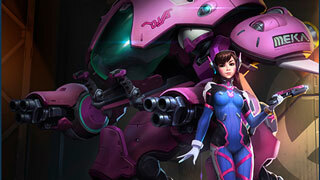 When Blizzard kicked off the Nexus Challenge 2.0 event at the end of last month, we knew there were some D.Va based rewards that players would receive in both games for playing HotS, and now you can play as D.Va in Blizzard's MOBA, at least on the PTR. D. Va becomes the fifth Overwatch character to make the jump to Heroes, joining, Genji, Lucio, Tracer, and Zarya. As you'd expect, she can fight in either Pilot Mode or Mech mode. Mech Mode allows her to fight inside her mech until it is destroyed, at which point she is ejected and continues the fight in pilot mode. Killing her mech rewards you with half of a normal hero's experience. She can shoot while moving in Mech Mode, but she moves 15 percent slower. In Pilot Mode, her basic attacks reduce the cooldown time on her Call Mech ability, and if you happen to kill her in that mode, you'll only get half of a normal hero's experience reward. Her abilities include the ability to increase movement speed by 125 percent for two seconds, and to damage and knock back any enemies she hits. She can use her Defense Matrix Mode to channel a defensive field that reduces damage dealt by enemy heroes caught in it by 75 percent. Finally, she can either self-destruct her mech causing "medium to massive damage" in a large area. This blast deals half damage against structures. If she's in pilot mode, she can call in a new mech to pilot. Her Heroic abilities include a bunny hop that makes her mech invincible or a "Big Shot" that hits all enemies in a line, reducing the cooldown of Call Mech for each enemy hero hit. You can find all the info on the new PTR patch in this post on the Heroes of the Storm blog.